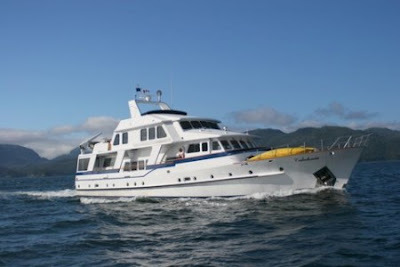 * Four beautiful staterooms, including Master suite, VIP cabin and two Twin cabins, all with private heads and showers. Unlike a larger cruise ship, the Caledonia does not have to limit her travel to deeper waters. Hence, she can respond more readily to the interests of her passengers. She can get closer to shoreline for better sightseeing and into tight places where the secrets of the Inside Passage are waiting to be discovered. Her beautiful new interior with its remodeled galley, granite countertops, imported mirrored-finished vanity bowls, highly varnished teak trim and newly appointed staterooms include all the creature comforts and aesthetic touches that make for a truly luxurious wilderness experience. The Caledonia’s is a beautiful classic steel Feadship Motor Yacht that has been totally refurbished from exterior paint to new linens in the highly appointed staterooms. With a plasma screen/Bose sound system equipped entertainment center, 28 foot fishing tender “Caly” with enclosed heated cabin and head (comes furnished with your experienced Alaskan guide/captain and fishing tackle), two kayaks, a 16 foot Lund skiff (with 40hp four stroke) water maker, stabilized to eliminate rough sea effects, and a great fully equipped wet bar for relaxing. Additionally there is a 4 four person hot tub to unwind and take in the Alaskan scenery.